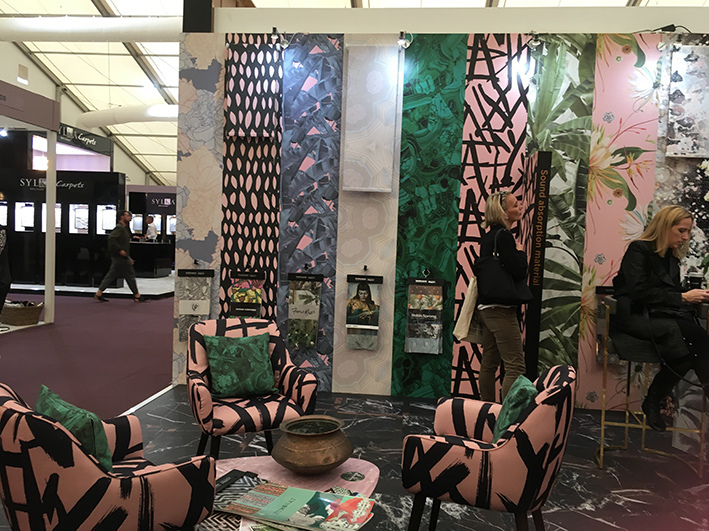 Reporting from Decorex; London’s internationally renowned destination for interior design professionals to unwrap the finest and most coveted luxury products. 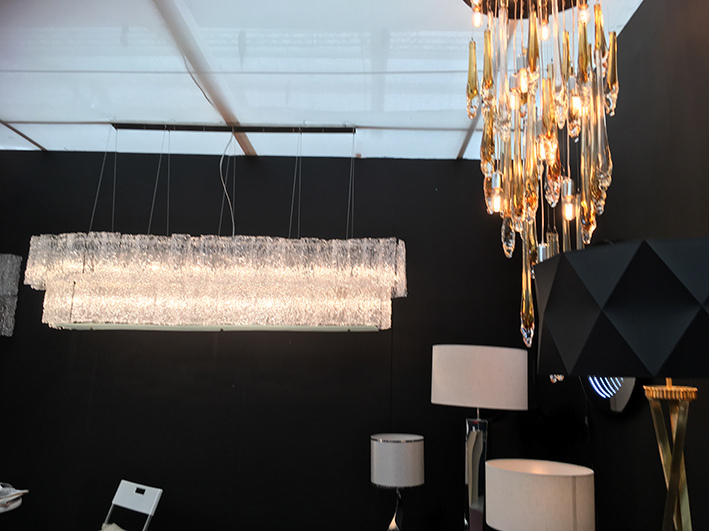 Celebrating its 40th edition this year, I couldn’t wait to race to Decorex International. So, as soon as the doors opened on 17th, and with VIP invite in hand, I headed in to witness the launch of new collections and gain insights into the latest trends by industry experts. With hundreds of stands opening their doors to the industry, and over 120 new exhibitors this year, Syon Park was the place to find new, emerging and established talent. 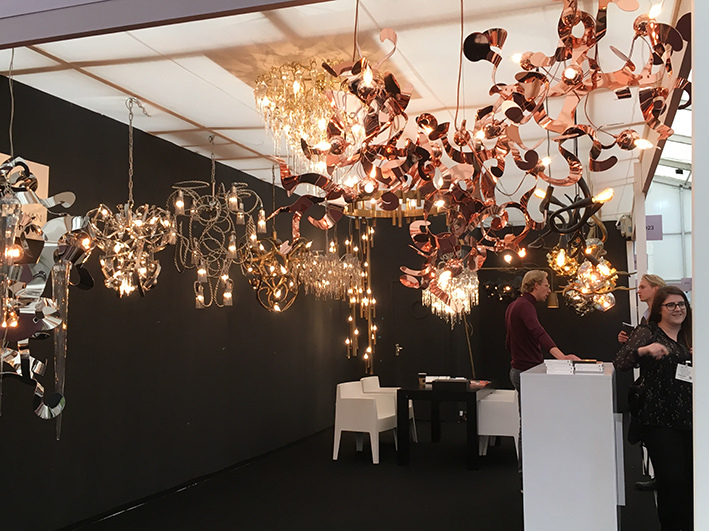 Even if your wallet won’t allow you more than a viewing - as chandeliers reached values of more than £300,000 - you will surely come away with an abundance of ideas to get your creative juices flowing. I have to say, for me, it’s somehow felt a little more exciting and authentic when it was located in Kensington, nearer to the hub of Chelsea harbour, where I would soak up the vibe of London, it’s cosmopolitan and upmarket shops & architecture. Whilst it was a bonus that Syon Park offered on-site parking, it was to be expected that the queues to get out of the place would be long. From the moment I arrived, there was an excited, bubbling of energy that could not be ignored. I grabbed my free exhibition bag and I was off! Giant splashes of colour were simply everywhere. So ladies; be bold and brave, and get a little bit organic with your style this year. The soft pinks, pastel shades, and the bold greens seem to have cemented their place yet again, and are definitely here to stay; they acted beautifully as a backdrop, in the form of wall coverings, fabrics, flooring and artwork, where organic, leafy scenes and hand painted furniture pieces were featured throughout the expanse of this show. So, from me, what stood out? 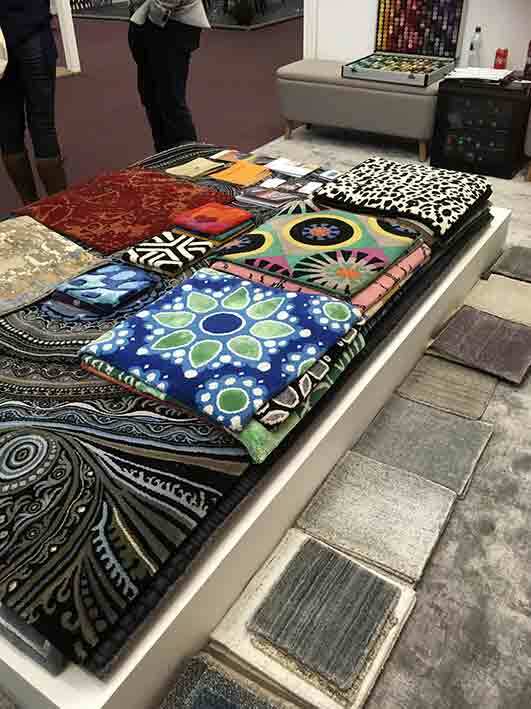 Firstly, a shout-out to Knots of Rugs for their giant, bold, high-end display of rugs – just stunning. For something more affordable yet still offering fabulous quality visit Rug Couture – they offer a colour matching service and a plethora of designs to choose from, allowing you to create your own bespoke piece of artwork on the floor, and all at the touch of a button online… Or contact me at Ruler for further discounts. 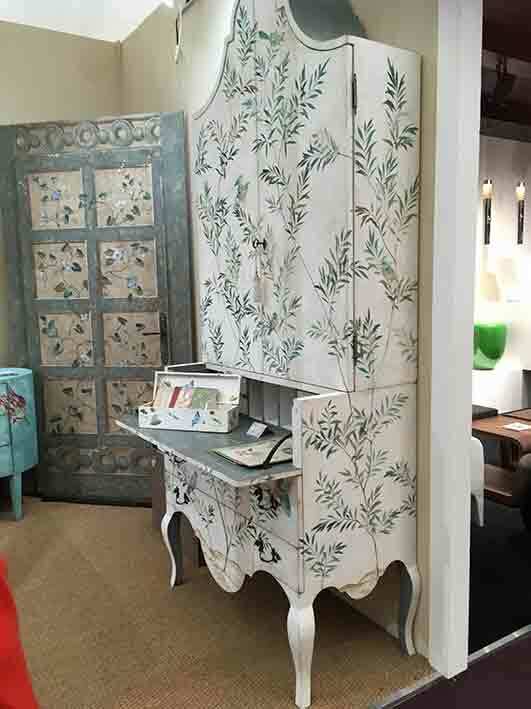 If a one-off piece of beautifully restored Oriental furniture is on your mind, visit Orchid. For a simila,r yet more affordable flavour, visit Oka. 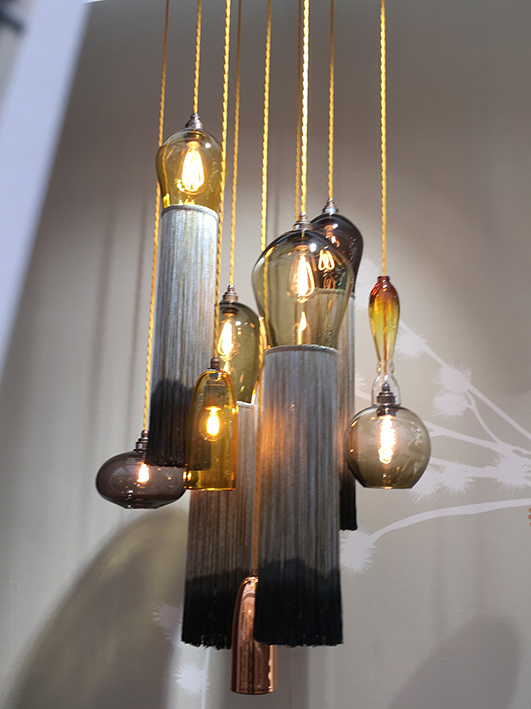 There was so much opulent lighting to be seen, but my vote went to Lasvit and Veronese for their subtle, contemporary stands, displaying simple yet stunning lighting pieces. Less is definitely more for me sometimes. Whilst on the subject of simplicity, Clarke and Clarke still do staple simplicity with perfection, with their range of affordable fabrics. 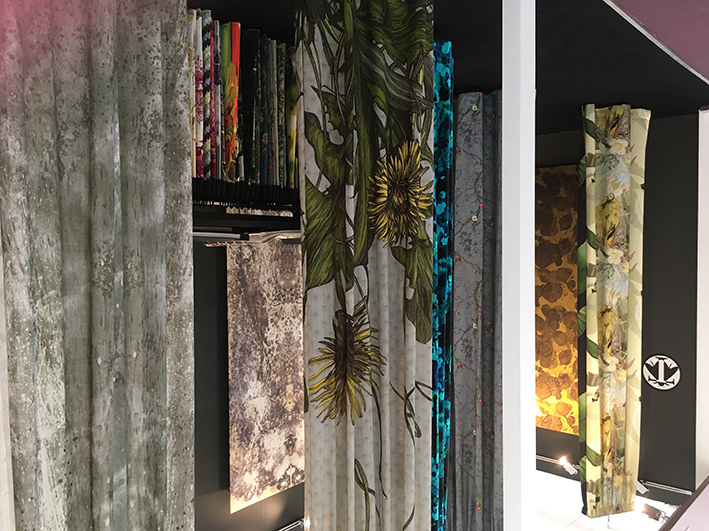 Once again Wendy Cushing’s range of curtain tie-backs did not disappoint and would bring a taste of luxury to any setting. For stunning bespoke wood flooring, that is truly an art-form, Walking on Wood has to be your next stop, for artisan joinery and colour matching. Alternative Flooring offered some amazing new products at very affordable prices and best of all, bleach cleanable! Check out their new Bikram and Hatha ranges for beauty and comfort. For that wow factor, you have to check out Meystyle for their range of LED wallpaper. It doesn’t come cheap but boy will you make a statement that cannot be denied in any setting. 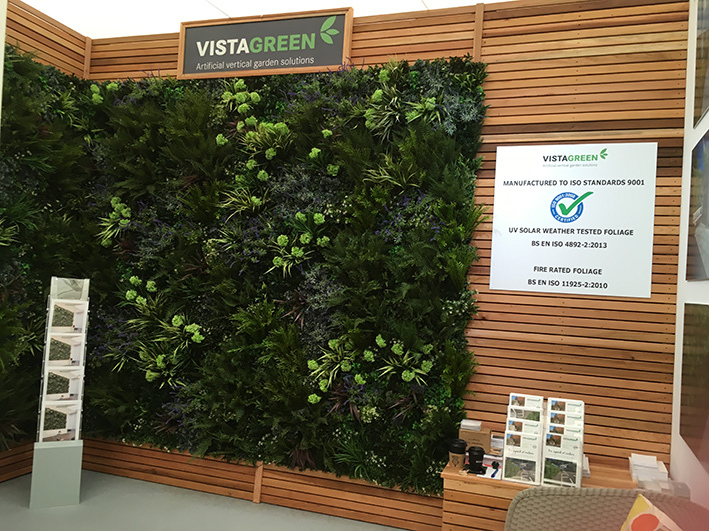 Vista Green offered a magnificent alternative to real foliage with their UV, solar, fire rated, weather tested foliage. You will never need to get your strimmer out again! So that’s it for me ‘till next year. I hope I’ve shared some good ideas with you? You may find some of these companies will only open their doors to the trade, but they will always provide a list of retailers you can buy from, or stop by Ruler for further discounts. Ps... if you want to know more about Decorex, the exhibitors there or interior design, please feel free to contact me.